Epson recommends that you keep your Stylus Pro machine in an environment ranging from 40 to 60% relative humidity. 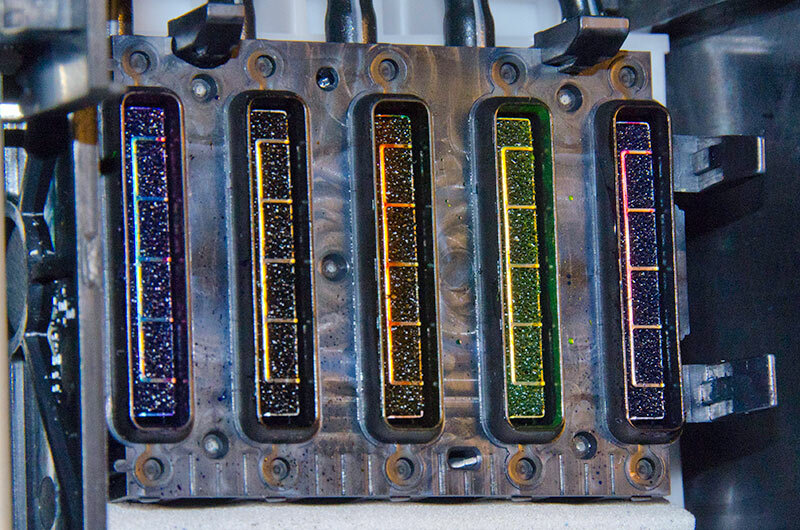 What you are fighting here is drying ink in the face of the printhead while you are not printing. Some users spray distilled water onto the face of the capping station before parking the head for non-printing periods of time. You could expand on this theory by adding glycerol (a humectant) to your distilled water before you spray the docking station. Be gentle with your mixture though, maybe 5% glycerol to 95% distilled water – glycerol is kind of sticky. I made a clear poly cover for my 7900 and left a bucket of water under the printer, inside the cover. 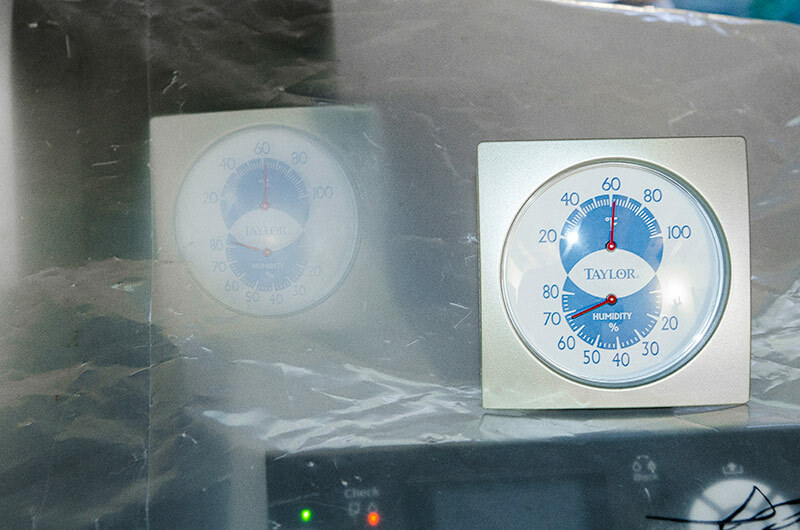 I monitored the relative humidity just outside the cover compared to inside – there was a consistent 10% difference. 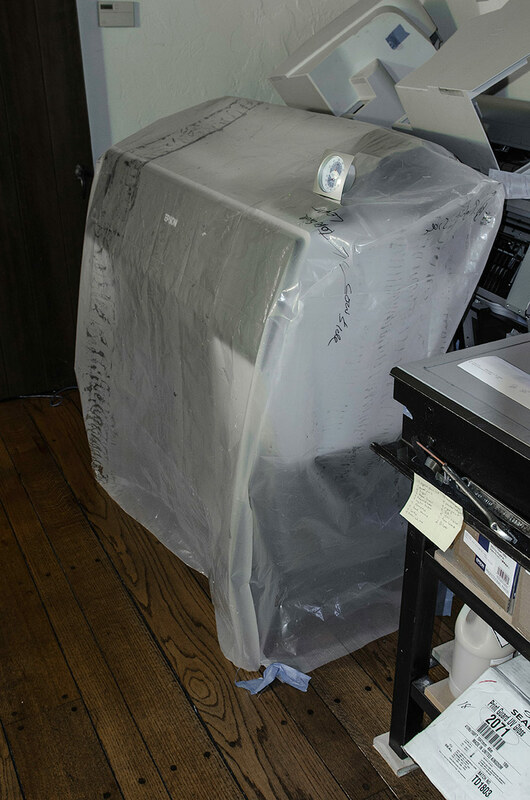 If your printer is in a dry environment, get a cover for it and try the bucket of water trick. Sounds ridiculous but it helps. The other place a cover helps, immensely, is dust/dirt/dog hair/cat hair protection. I am friends with an Epson tech who has a regular client, like once every two months, who asks him to come clean his machine of animal hair. That man needs a cover.. This cover was sewn by me. I’m going straight to the fashion industry next. This is insane. Why wasn’t this lawsuit material? This printer is utter trash. I put a narrow role of inexpensive 24# bond paper in my 9900 and set my Mac to run a script every morning that prints an 8.5×11 test image that has a full range of colors in the image and it has kept the heads wet for several years including some 1-2 week periods when I printed nothing else. omg, where have you been my whole life? I sell these freakin printers in NYC and can now offer extra help to clients on this TOP SECRET world. Will consider a donation to you with my first wiper blade replacement. Just parked my printer for a few months in container 🙂 hopefully it will not dry out ! If it dose do dry , what’s the worse scenario ? !